Mexico’s president caps his first year in office with landmark legislation opening oil sector to foreign investment. One year into his presidency, Enrique Peña Nieto still acts like hes in the midst of a heated election campaign. Showing a sense of urgency his predecessors lacked, he began November by visiting an elementary school in Villahermosa, Mexicos oil capital, to hand out laptop computers to nervous ten-year-olds in white uniforms, underscoring his drive to modernize Mexicos educational system. A few days later he opened a $2 billion Nissan assembly plant in Aguascalientes, a northern city thats becoming a center of the countrys booming auto industry. And before the week was out, he stopped by a new diabetes center in Mexico City to mark the passage of hefty taxes on junk food and sugary drinks, which he hopes will bring down the worlds highest rate of adult obesity. The lives of millions of Mexicans are literally at stake, Peña Nieto told his audience. The 47-year-old president may have film star looks, but he isnt pursuing photo ops for his own vainglory. Hes promoting his agenda of economic and social reforms, the most ambitious Mexico has seen in a generation. Since taking office Peña Nieto has won passage of legislation to break open monopolies in the telecommunications and television sectors, raised taxes on the wealthy, pushed to make bank loans more accessible to businesses and consumers and initiated efforts to overhaul an underperforming school system. Even more audacious, the president has reversed more than seven decades of energy nationalism by championing landmark reforms to open up the oil and gas sector to foreign investment for the first time in modern history. In mid-December, Congress voted to amend the countrys constitution to allow the energy reform to proceed; a majority of state legislatures promptly endorsed the measure, and the president signed it into law on December 20. Our aim is to transform Mexico into a more productive and competitive nation, says Peña Nieto in an e-mail response to questions from Institutional Investor. Investors are hoping he succeeds. The various reform measures could allow Latin Americas second-largest economy to grow by 6 percent a year, on a par with some of the worlds leading emerging markets. The reforms currently being debated can be truly transformational for Mexico, particularly if the energy sector becomes more market friendly, says Alberto Ramos, New Yorkbased Latin America economist for Goldman Sachs Group. On December 19, Standard & Poors Corp. raised its rating on Mexicos long-term debt by one notch, to BBB+, calling the energy reform a watershed moment that brightened the countrys growth outlook. Not since the early 1990s, when Mexico joined the North American Free Trade Agreement and privatized its big banks and telephone company, has the government embarked on such far-reaching changes. Moreover, this reforming zeal comes from the leader of the Institutional Revolutionary Party (PRI), an organization so tainted by corruption during its 71-year reign that ended in 2000 that many analysts considered it too discredited to ever return to power. 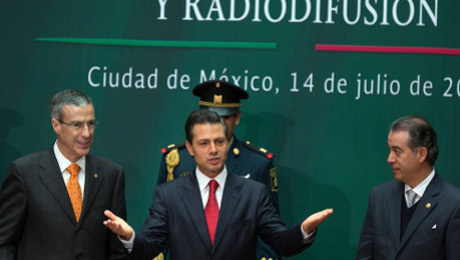 Peña Nietos two immediate predecessors  Vicente Fox and Felipe Calderón of the conservative National Action Party (PAN)  both attempted to carry out similar reforms but failed miserably because of opposition from the left-wing Party of the Democratic Revolution (PRD) and from Peña Nietos center-left PRI. The pact also allowed the president to claim the political center. Peña Nietos government has shifted right to gain support from the PAN for energy reform, leaned left for PRD backing on taxes and rallied both opposition parties behind changes in education and antitrust policy. Unlike Fox and Calderón, he has a keen sense of political timing and real skill at putting together coalitions, says James Jones, a former U.S. ambassador to Mexico who runs Manatt­Jones Global Strategies, a Washington-based firm that advises businesses on Latin America. 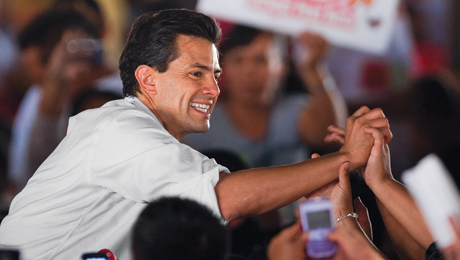 It is still too early in Peña Nietos six-year term to judge whether he can fully deliver. It remains to be seen whether the government will effectively wield its new antimonopoly powers, for instance. If Peña Nieto is to succeed, he will have to revive a stalled economy. The slowdown threatens to erode the PRIs pluralities in Congress, where the party holds 57 of 128 Senate seats and 212 of 500 seats in the Chamber of Deputies. Economic output was expected to grow by only a little more than 1 percent in 2013, the Banco de México, the countrys central bank, forecast in November. In addition to the global slowdown that hit emerging markets from Brazil to India in the first half of 2013, Mexicos slump reflects the impact of a traditional lull in spending during a new governments first year in office, as well as an implosion in the residential construction sector. It takes a while for a new administration to go over the budgets of the previous government and decide how much to spend, says Sergio Martín, a Mexico Citybased economist for HSBC Holdings. He notes that the economy shrank by an average of 0.2 percent during the first year of the previous four administrations. This time, however, investors had been hoping that a dynamic new president would maintain growth near the 2012 rate of 3.9 percent. 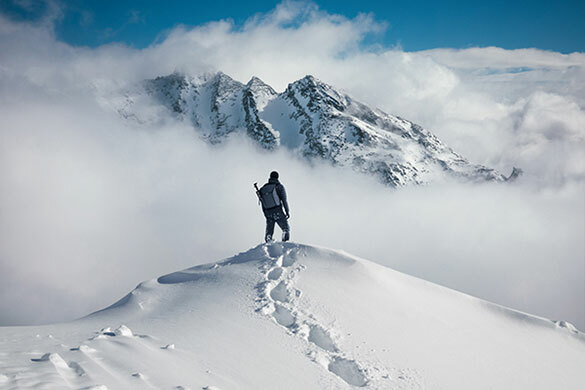 The slowdown took us by surprise in its magnitude and duration, says José Costa Buck, London-based manager of T. Rowe Prices Latin America Fund. Government spending is getting back on trend. The housing market may weigh on the economy for some time, though. Three big developers are on the verge of bankruptcy after gambling on housing projects that failed to win government subsidies. HSBC estimates that the housing crisis will reduce growth by half a point in 2013. It also could exert a drag on the economy in 2014, threatening the 3 percent growth forecast by the International Monetary Fund. Improving education wont be easy. According to the World Economic Forums Global Competitiveness Report for 201112, Mexico ranked 120th out of 139 nations for the overall quality of its schools. The country needs a better-educated labor force if it is to build upon its recent industrial triumphs, which have seen it become the worlds leading exporter of refrigerators and flat television screens and the fourth-largest exporter of automobiles. Although Gordillos supporters staged disruptive protests in Mexico City and elsewhere in the country, Peña Nieto won the support of the three major political parties to pass a reform bill in September that ordered an end to inherited teaching posts and called for mandatory evaluation tests for teachers every four years. The protests did, however, force legislators to grant teachers the right to contest any dismissals in special courts. 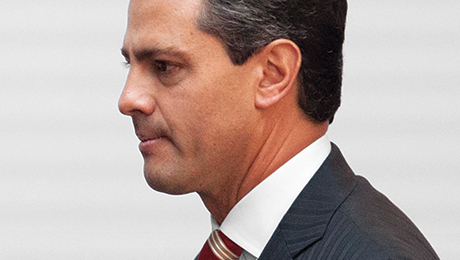 The crackdown on Gordillo gave Peña Nieto the credibility to tackle monopolies. His government began by going after Mexicos two most powerful business magnates: Carlos Slim Helú in telecoms and Emilio Azcárraga in television. Slim, the worlds second-wealthiest person after Microsoft Corp. founder and chairman Bill Gates, controls 80 percent of the countrys landline telephone system through his Teléfonos de México (Telmex) and 70 percent of the cellular market through his América Móvil. His dominance costs the Mexican economy about 1.8 percent of GDP annually  about $22 billion in 2013  in excessive phone bills for consumers and high connectivity charges for rival telecoms, according to estimates by the Organization for Economic Cooperation and Development. Slim vigorously rejects the OECD figures, but in many isolated communities his companies provide the only effective phone service. In the marketplace of El Nith, a village in the central state of Hidalgo, a dozen campesinos line up to use the pay phones operated by Telmex. Consuelo Jiménez, owner of a nearby dry-goods store, tried a cheaper cell phone rival  Iusacell, owned by retail and broadcasting mogul Ricardo Salinas Pliego  but switched to Slims América Móvil. I couldnt get through to my suppliers, she explains. Azcárragas Grupo Televisa also dominates in El Nith. Jiménez is an avid fan of telenovelas, or soap operas, produced by Televisa, which has 73 percent of Mexicos TV market. Her favorites are reruns of Teresa, a 2010 telenovela about a greedy young woman from a Mexico City slum who turns her back on her doting working-class parents. Its like real life, even here in El Nith, says Jiménez, 37, who calls her own adolescent daughter spoiled. The governments antimonopoly legislation, which Congress passed and Peña Nieto signed in May, opens the telecom and TV markets to foreign players through wholly owned subsidiaries or joint ventures with Mexican companies. So far, no outside companies have announced plans to enter the market. They are waiting for secondary legislation, due in 2014, that will set limits on the connection fees that Slims companies can charge and designate the spectrum that will be made available to broadcasting start-ups. Given the dominance enjoyed by Slim and Azcárraga, it will be hard slogging for any new rivals, even deep-pocketed multinationals. Tax reform has followed a similar arc of bold ambition followed by more-modest delivery. The president made the issue a top priority because Mexico has one of the worst tax collection systems in Latin America. Half the population is too poor to pay income tax. Of the rest, about 60 percent is part of the informal sector, working off the books as construction laborers, messengers and the like or running small businesses that report no income. Thus some 20 percent of Mexican adults carry the burden of income tax. Largely as a result, Mexicos tax revenues  everything from income tax to value-added tax  amount to a paltry 10 percent of GDP, the lowest level among the 34 members of the OECD. By contrast, Chile has a tax take of 20 percent of GDP and Brazil 25 percent. To buttress its revenues, the government grabs a big slice of the export earnings generated by state-owned Petróleos Mexicanos (Pemex). Revenue from the oil and gas monopoly covers more than 30 percent of federal and state spending. That heavy drain leaves Pemex, already saddled with huge debts and low productivity, with little money to invest in potentially lucrative new fields, causing production to decline sharply. So the impact of a real fiscal reform would be huge, says Alfredo Coutiño, Latin America director for Moodys Analytics, based in West Chester, Pennsylvania. Peña Nieto began his presidency by declaring his intention of increasing tax revenues to 13 percent of GDP by the end of his term, in 2018. His proposal ran into a barrage of opposition. The left-leaning PRD scuttled plans to impose value-added taxes on food and medicine. The conservative PAN abandoned negotiations on fiscal reform after the government failed to come up with a credible plan for including the informal sector in the tax rolls. Real estate developers beat back government efforts to impose taxes on property sales, rents and mortgages. Politicians and economists of all stripes also argued that it made no sense to raise taxes at a time when the country faced a possible recession. In October, after four months of debate, the government won enough support from the PRD to push its bill through Congress, by agreeing not to increase taxes on the middle class while raising rates on the affluent. Beginning in 2014, Mexicans earning more than 3 million pesos ($227,000) a year will see their tax rate rise to 35 percent from the current 30 percent; for those earning more than 750,000 pesos, the rate will rise by 2 points, to 32 percent. The law also imposes an 8 percent levy on junk food and sugary sodas. That measure won support because Mexico this year surpassed the U.S. as the nation with the highest rate of adult obesity: 32.8 percent. Some analysts contend that the government can achieve genuine fiscal reform only if it opens the oil and gas sector to private investment. Making the energy sector more modern and efficient will generate a lot more fiscal revenue, says Goldman Sachs Ramos. In the meantime, Mexico will continue to squeeze Pemex to meet federal budget shortfalls. Already, the government has announced that because of the watering down of its tax reform proposal it will raise its 2014 price estimates for Mexican crude oil to $85 a barrel from $81 previously  and pocket the additional Pemex revenue to keep a lid on the budget deficit. (The government typically uses a conservative oil price target in its budget. With Mexican crude trading at $93.86 a barrel in early December, the new revenue estimates appear achievable.) As always, the government is linking public revenues to oil prices, Coutiño says. Reforming the oil sector has been a goal of Mexicos governments since Foxs day, but previous efforts have failed for deep-seated reasons. Sovereignty over energy resources is a basic tenet of national identity. Mexicans celebrate March 18 as a national holiday  Oil Expropriation Day  to commemorate the day in 1938 when the government seized U.S., British and Dutch oil assets. In 1960, Pemex gained a monopoly over oil and gas activities through a constitutional amendment. For decades the arrangement suited everyone. Oil was Mexicos primary export, and Pemex generated the lions share of government revenues, keeping tax rates low. The Pemex workers union swelled the companys job rolls with the sons and nephews of older employees. The union took possession of numerous refineries and gasoline stations, enriching its coffers, lining the pockets of corrupt labor leaders and bankrolling sympathetic politicians. By the turn of the millennium, however, easy-to-access oil reserves in the shallow waters of the Gulf of Mexico were drying up. Oil production fell from a high of 3.4 million barrels a day in 2004 to 2.5 million this year. Pemex is one of the most inefficient oil and gas companies in the world. In 2012, Pemex and its 151,000 workers produced $129 billion in revenue; Exxon Mobil Corp., with barely half as many employees (76,900), generated more than three times as much revenue ($453 billion). The Mexican companys 2012 net income of $390 million paled in comparison with ExxonMobils $45 billion. At the end of September, Pemex had net debt of $53.3 billion and $103 billion in unfunded pension liabilities. Energy reform would seem to be a no-brainer. Exports have fallen from a 2004 peak of 1.9 million barrels a day to the current 1.2 million. (Thanks to higher crude prices, however, export earnings rose to $47.5 billion from $28.8 billion during the same period.). Mexico imports half of its gasoline and a third of its natural gas from the U.S., costing it $20.2 billion in 2012. While the U.S. hurtles toward energy self-sufficiency thanks to the shale oil and gas revolution, drilling 10,000 new wells a year, Mexico plans to drill only 140 such wells a year, even though its shale reserves are believed to be as large as those in Texas. The idea of allowing foreigners access to Mexicos oil and gas reserves remains anathema. For many Mexicans the privatization of public assets a generation ago simply transferred state monopolies to politically well-­connected entrepreneurs like Slim. Peña Nieto stresses that his government is not seeking to privatize Pemex or turn over concessions to foreign companies. I presented a bill that requires modifying the constitution in order to enable Mexico to have strategic partnerships to share production risks and profits, while retaining national ownership of reserves at the same time, he says in his e-mail. The energy bill enacted in December will allow foreign companies to enter into profit- and production-sharing agreements with Pemex to explore and drill for oil and gas. The law also will permit Mexicos Energy Department to auction oil and gas licenses, mostly for deep-water projects, and then collect taxes and royalties from companies for any oil and gas produced. Peña Nieto had to win a two-thirds majority in Congress for the legislation because it amended Articles 27 and 28 of the constitution, which maintain national sovereignty over hydrocarbons. To do so, he assembled a coalition of legislators from his own PRI and the PAN, which advocates concessions for foreign oil majors in exploration and production. The PAN agreed in September to back energy reform if the government would endorse electoral changes to permit legislators to run for consecutive terms  a move that would result in a better balance of power between Congress and the presidency. Notwithstanding the presidents victory, opposition to energy reform runs deep. According to an August poll ordered by Congress, 55 percent of voters oppose a constitutional change. Andrés Manuel López Obrador, the firebrand PRD candidate who ran second in the 2012 presidential election, has promised to lead popular protests against energy reform. As with the presidents other initiatives, legislative approval of energy reform was only an initial step. The government needs to introduce secondary legislation to establish the new investment rules for the sector. It wont be good enough for the government and Pemex to say, We have finally opened up our doors, says IPDs Padilla. The recent Brazilian offshore auction has sent a clear message that this has become a buyers market. Companies will choose the more profitable projects. Spokesmen for oil majors declined to comment on Mexican energy reforms, citing the political sensitivities involved. Bank reform, another work in progress, also could have a big impact on the economy. Mexican banks suffered huge losses during the 199495 Tequila Crisis, a financial meltdown triggered by a large current-account deficit, political instability and an abrupt devaluation of the peso. In the aftermath banks spent almost a decade building up capital and liquidity. Not only was credit tight, but the banks became notorious for charging high interest rates and imposing hefty fees and commissions that drove away potential clients. Net interest margins for the industry have fallen only recently, from 5.9 percent in 2009 to 3.8 percent at the end of June 2013, according to official figures. The results have been impressive for the health of the system, which is dominated by seven banks, five of them subsidiaries of foreign institutions. According to HSBC, Mexican banks have an average core tier-1 capital ratio of 14 percent, double the 7 percent required under Basel III. Return on equity for most big banks stands at enviable levels: Market leader BBVA Bancomer posted a 25.2 percent ROE in the first half of 2013 while Grupo Financiero Banorte stood at 16.9 percent and Banco Santander (México) at 16.5 percent. The industrys strength has done little for the broader economy, though. Bank loans to the private sector amount to just 27.7 percent of GDP, the lowest level of any comparable emerging-markets economy and well below Brazils 68.4 percent and Chiles 73.3 percent, according to the World Bank. In the near term the financial collapse of the three leading Mexican homebuilders  Desarrolladora Homex, Corp. Geo and Urbi Desarrollos Urbanos  is making banks more cautious about extending new loans. Between 2008 and 2012 the three companies built 631,000 units of housing for more than 2.5 million blue-collar workers and their families. They also bought large tracts of land well outside major cities for future developments. In 2012, however, the Calderón administration cut off government loans and subsidies for such projects, saying it made more sense to concentrate future housing developments in high-rise buildings closer to urban centers. Peña Nieto confirmed that stance shortly after taking office. 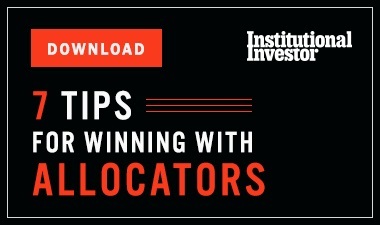 The policy shift caught big developers off guard, leaving them with large amounts of uneconomic land and little capital to acquire properties closer to city centers. A sharp drop-off in property sales depleted their cash balances and left them unable to repay bank loans or meet bond obligations. When it became clear last year that the new government wouldnt bail out the developers, their shares plunged. The biggest residential builder, Homex, reported losses of 10.2 billion pesos in the second quarter and 3.5 billion pesos in the third; its stock price tumbled from 27.86 pesos at the beginning of the year to 2.35 pesos in late November. Geo and Urbi havent reported results since the second quarter, and trading in their stocks has been suspended. Germán Ahumada, chairman and CEO of Consorcio ARA, one of the few major developers to remain profitable, says some builders borrowed and built recklessly, but he insists that others share the blame for the industrys debacle. The banks are also at fault because they made very sloppy evaluations of those developers, he contends. Some bankers agree. It was clearly a mistake, and we are trying to figure out how we allowed such a risk concentration to occur, says Ortíz. Banortes nonperforming loans rose to 1.9 percent of all loans in June 2013 from 1.6 percent at the end of 2012, largely because of impaired loans to developers; it increased provisions for bad and doubtful debts to 5.2 billion pesos in the first half, up 96 percent from the same period a year earlier. For the entire Mexican banking system, the NPL ratio climbed to 3.0 percent in June from 2.6 percent at the end of 2012.